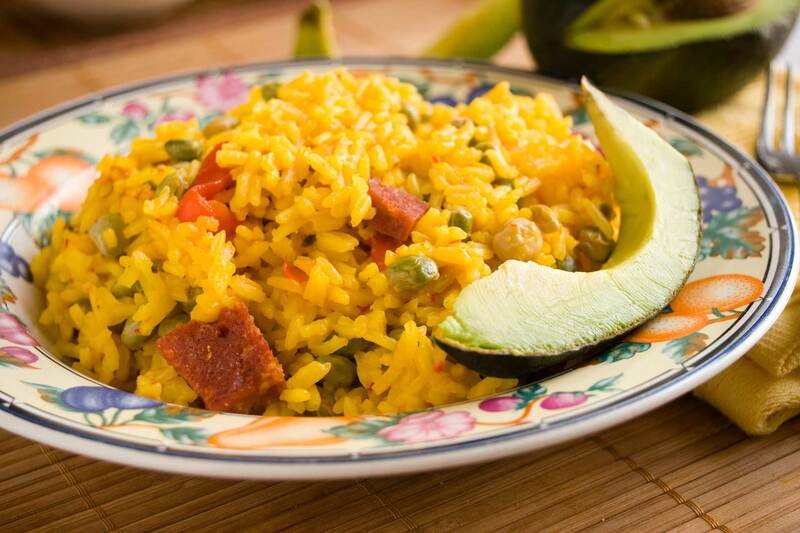 Although Puerto Rican cooking is somewhat similar to both Spanish, Cuban and Mexican cuisine, it is a unique tasty blend of Spanish, African, Taíno, and American influences, using such indigenous seasonings and ingredients as coriander, papaya, cacao, nispero, apio, plantains, and yampee. Locals call their cuisine “cocina criolla”. Cocina criolla (Créole cooking) can be traced back to the Arawaks and Tainos, the original inhabitants of the island, who thrived on a diet of corn, tropical fruit, and seafood. When Ponce de León arrived with Columbus in 1493, the Spanish added beef, pork, rice, wheat, and olive oil to the island’s foodstuffs. Soon after, the Spanish began planting sugarcane and importing slaves from Africa, who brought with them okra and taro (known in Puerto Rico as yautia). 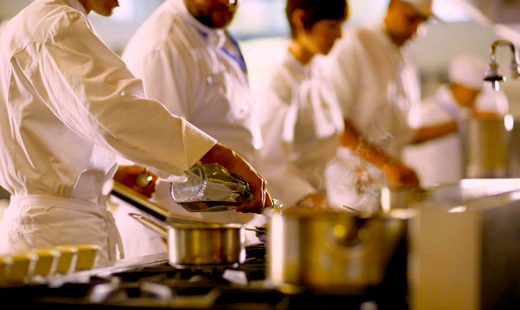 The mingling of flavors and ingredients passed from generation to generation among the different ethnic groups that settled on the island, resulting in the exotic blend of today’s Puerto Rican cuisine. Lunch and dinner generally begin with sizzling-hot appetizers such as bacalaitos, crunchy cod fritters; surullitos, sweet plump cornmeal fingers; and empanadillas, crescent-shaped turnovers filled with lobster, crab, conch, or beef. Soups are a popular beginning for meals on Puerto Rico. There is a debate about whether one of the best-known soups, frijoles negros (black-bean soup), is Cuban or Puerto Rican in origin. Nevertheless, it is still a savory, if filling, opening to a meal. Another classic soup is sopón de pollo con arroz -chicken soup with rice- which manages to taste somewhat different in every restaurant. One traditional method of preparing this soup calls for large pieces of pumpkin and diced potatoes or yautias (the starchy root of a large-leaved tropical plant whose flesh is usually yellow or creamy white). The third classic soup is sopón de pescado (fish soup), prepared with the head and tail intact. Again, this soup varies from restaurant to restaurant and may depend on the catch of the day. 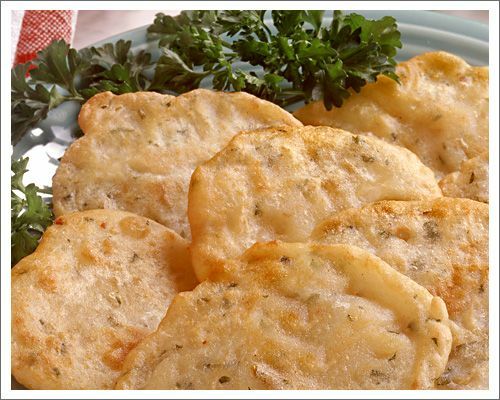 Traditionally, it is made with garlic and spices plus onions and tomatoes, the flavor enhanced by a tiny dash of vinegar and a half cup of sherry. Galician broth (caldo gallego) is a dish imported from Spain’s northwestern province of Galicia. It is prepared with salt pork, white beans, ham, and berzas (collard greens) or grelos (turnip greens), and the whole kettle is flavored with spicy chorizos (Spanish sausages). Garbanzos (chickpeas), are often added to give flavor, body, and texture to Puerto Rican soups. One of the most authentic versions of this is sopón de garbanzos con patas de cerdo (chickpea soup with pig’s feet). Into this kettle is added a variety of ingredients, including pumpkin, chorizos, salt pork, chile peppers, cabbage, potatoes, tomatoes, and fresh cilantro leaves. Not really a soup, the most traditional Puerto Rican dish is asopao, a hearty gumbo made with either chicken or shellfish. One well-known version, consumed when the food budget runs low, is asopao de gandules (pigeon peas). 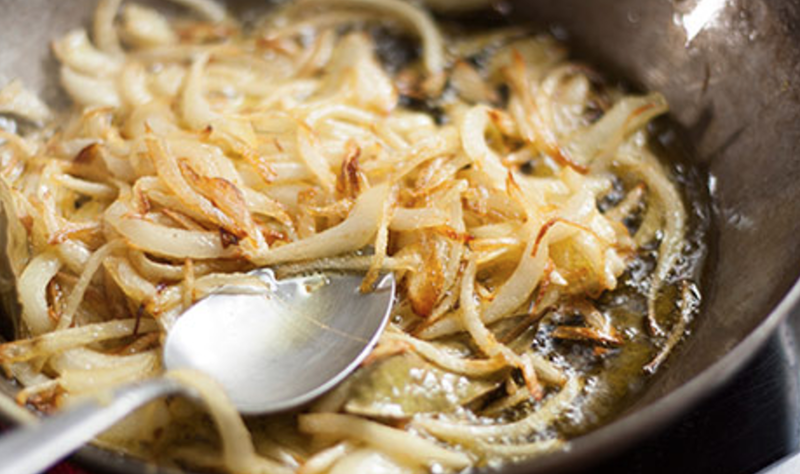 Every Puerto Rican chef has his or her own recipe for asopao. Asopao de pollo (chicken asopao) takes a whole chicken, which is then flavored with spices such as oregano, garlic, and paprika, along with salt pork, cured ham, green peppers, chile peppers, onions, cilantro, olives, tomatoes, chorizos, and pimientos. For a final touch, green peas or asparagus might be added. The aroma that wafts from kitchens throughout Puerto Rico comes from adobo and sofrito -blends of herbs and spices that give many of the native foods their distinctive taste and color. Adobo, made by crushing together peppercorns, oregano, garlic, salt, olive oil, and lime juice or vinegar, is rubbed into meats before they are roasted. Sofrito, a potpourri of onions, garlic, coriander, and peppers browned in either olive oil or land and colored with achiote (annatoo seeds), imparts the bright-yellow color to the island’s rice, soups, and stews. 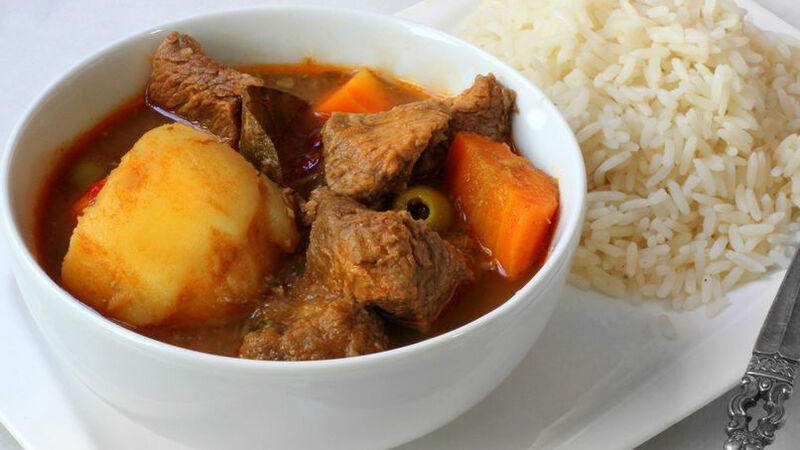 carne guisada puertorriqueña; (Puerto Rican beef stew). The ingredients that flavor the chunks of beef vary according to the cook’s whims or whatever happens to be in the larder. These might include green peppers, sweet chile peppers, onions, garlic, cilantro, potatoes, olives stuffed with pimientos, or capers. Seeded raisins may be added on occasion. Meat pies (pastelón de carne) are the staple of many Puerto Rican dinners. Salt pork and ham are often used for the filling and are cooked in a caldero. This medley of meats and spices is covered with a pastry top and baked. Other typical main dishes include fried beefsteak with onions (carne frita con cebolla), veal (ternera) a la parmesana, and roast leg of pork, fresh ham, lamb, or veal, a la criolla. These roasted meats are cooked in the Créole style, flavored with adobo. Puerto Ricans also like such dishes as breaded calfs brains (sesos empanados), calfs kidney (riñones guisados), and stuffed beef tongue (lengua rellena). A festive island dish is lechón asado, or barbecued pig, which is usually cooked for a party of 12 or 15. It is traditional for picnics and al fresco parties; one can sometimes catch the aroma of this dish wafting through the palm trees, a smell that must have been familiar to the Taino peoples. The pig is basted with jugo de naranjas agría (sour orange juice) and achiote coloring. Green plantains are peeled and roasted over hot stones, then served with the barbecued pig as a side dish. The traditional dressing served with the pig is ali-li-monjili, a sour garlic sauce. The sauce combines garlic, whole black peppercorns, and sweet seeded chile peppers, flavored further with vinegar, lime juice, and olive oil. Puerto Ricans adore chicken, which they flower various spices and seasoning. Arroz con pollo (chicken with rice) is the most popular chicken dish on the island, and it was brought long ago to the U.S mainland. Other favorite preparations include chicken in sherry (pollo al jerez), pollo agridulce (sweet and sour chicken), and pollitos asados a la parrilla (broiled chickens). Most visitors to the island seem to like the fish and shellfish. 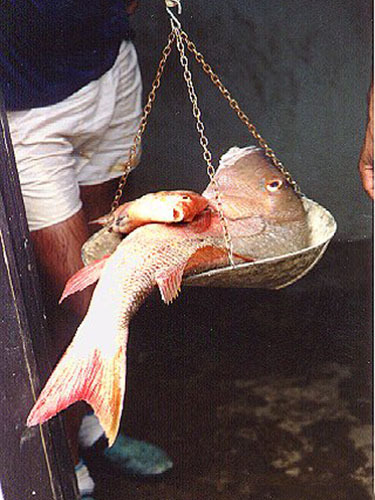 A popular fried fish with Puerto Rican sauce (mojo isleño). The sauce is made with olives and olive oil, onions, pimientos, capers, tomato sauce, vinegar, and a flavoring of garlic and bay leaves. Fresh fish is often grilled, and perhaps flavored with garlic and an overlay of freshly squeezed lime juice -a very tasty dinner indeed. Caribbean lobster is usually the most expensive item on any menu, followed by shrimp. Puerto Ricans often cook shrimp in beer (camarones en cerveza). Another delectable shellfish dish is boiled crab (jueyes hervidos). Many tasty egg dishes are served, especially tortilla española (Spanish omelet), cooked with finely chopped onions, cubed potatoes, and olive oil. The rich and fertile fields of Puerto Rico produce a wide variety of vegetables. A favorite is the chayote, a pear-shaped vegetable called christophone throughout most of the English-speaking Caribbean. Its delicately flavored flesh is often compared to that of summer squash. Breadfruit, prepared in a number of ways, frequently accompanies main dishes. This large, round fruit from a tropical tree has a thick green rind covering its starchy, sweet flesh. The flavor is evocative of a sweet potato. 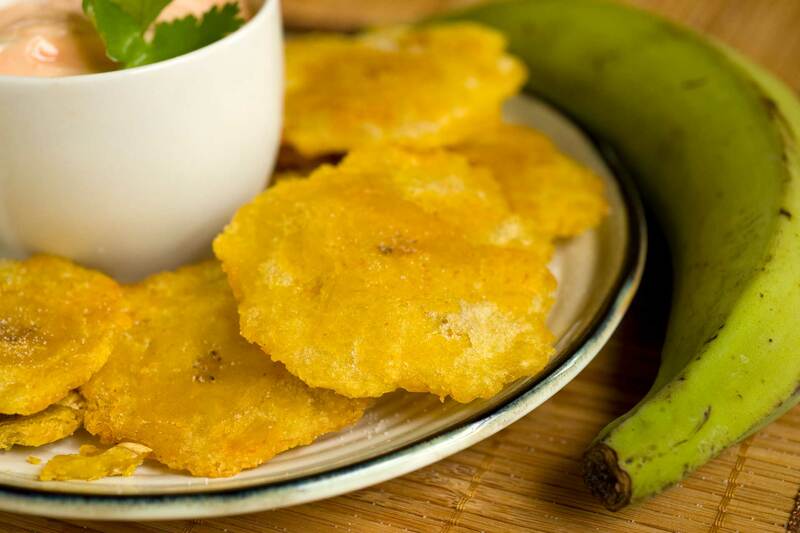 Tostones -fried green breadfruit slices- accompany most meat, fish, or poultry dishes served on the island. Tostones may also be made with plantains. 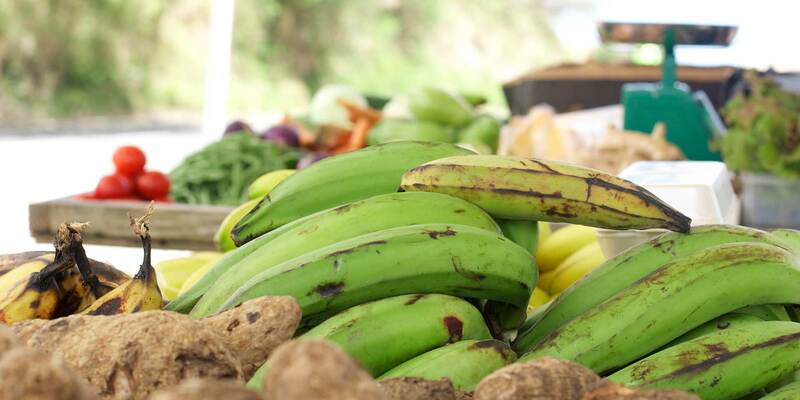 In fact, the plantains seems to be the single most popular side dish served on the island. Plantains are a variety of banana that cannot be eaten raw. They are much coarser in texture that ordinary bananas and are harvested while green, then baked, fried, or boiled. When made into tostones, they are usually served as a appetizer with before-dinner drinks. Fried to a deep golden-yellow, plantains may accompany fish, meat, or poultry dishes.